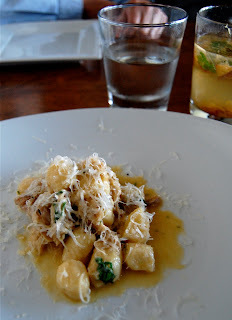 - Ricotta gnocchi with duck ragu - generous portion of meat, the ragu reminded me of my favorite from Osteria Mozza. - Sweet corn agnolotti with caramelized corn and parmesan (or as everyone now feels the need to say on menus, "parmigiano-reggiano") - spectacular. I want a lifetime supply. - mottled peach with basil and prosecco - fine but nothing special, the peach was not that flavorful but it tasted refreshing and summer-y. - a niman pork chop with peaches, corn, and basil - a bit disappointing, the meat was slightly overcooked. - the BURGER !! with caramelized onions, arugula, house made pickles, sharp cheddar and an herb remoulade - I have decided that this is my favorite burger of life, thus far (even better than Spruce). It isn't over the top, they don't try anything too elaborate it is just well seasoned and has great toppings. - Branzino with roasted artichokes, confit tomatoes, eggplant and a few more veggies - good, straightforward (ordered by the health-minded member of the group who enjoyed it but declared that next time he would be ordering the burger). If you wanted insight as to how the chef at Rustic Canyon, Evan Funke, prepares his burger click here (although you may prefer to be ignorant re: the fat that goes into making a sublime burger). Question: What is the Difference Between Parmesan and Parmigiano-Reggiano? Answer: Due to Italian D.O.C. 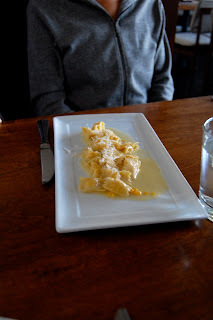 laws that protect the names and recipes of certain cheeses, a cheese cannot be called Parmigiano-Reggiano unless it is made using a specific recipe and production method within the provinces of Parma, Reggio-Emilia, Modena, and specific regions in the provinces of Bologna and Mantua. D.O.C laws are meant to preserve the integrity of traditional cheeses by insuring the flavor and quality. Therefore, any cheese made outside of these regions with a slightly different recipe or production method cannot be called Parmigiano-Reggiano . A cheese called Parmesan is essentially a cheese that imitates the recipe for Parmigiano-Reggiano, but is made outside of the approved Italian regions.